With deep faith in these words of the Lord, the early Christians anxiously approached Holy Communion, not because of some requirement, but from an immediate awareness that there was no spiritual life without Him. Just as one is not ordered to breathe, but spontaneously knows that without air he would suffocate and die. The early Christians attended all the Sunday and Holiday liturgies and at the Deacon’s invitation – with the fear of God and with faith, draw near , all the faithful lined up and received Holy Communion. They were convinced that they were attaining the deepest mystery of our faith and the holiest gift of God’s mercy. They tried to approach the all-holy and most pure God in Holy Communion with purity of heart and soul. They were called “holy” and they were truly holy for they protected themselves from every sin and they knew that “he who sins is a slave to sin”, that sin turns a person away from God, corrupts the soul and makes it incapable of receiving Holy Communion. One who fell into sin would immediately raise himself up through confession, cleansing his soul so that he would not commune unworthy. “For he who unworthy eats and drinks the Bread and Cup of life drinks condemnation.” At that time the early Christians kept all the tradition of the fast, understanding that fasting is a holy institution from the Old Testament. God ordered the fasting periods as an everlasting plan. 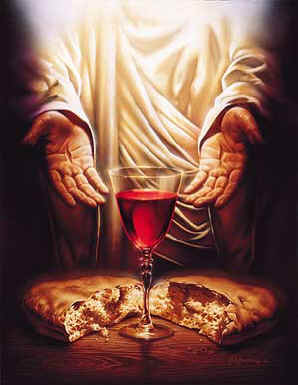 In the New Testament Jesus Christ Himself fasted and taught His Disciples to fast. The Apostles and Saints also kept this. The fasting periods were practiced at certain times as needed and Communion was administered regularly in the fasting seasons as well as when meat and dairy foods were used. During the fasting seasons they fasted and communed, during non fasts, they ate and communed just like the clergy do today. In the early Church there was no special preparation for Communion, nor was a fast considered as the only means for Communion. The preparation for Holy Communion was life-long process of keeping the commandments and guarding against all sin. For the first 300 years of the persecution of the Christian Church, this was the procedure kept by the clergy and laity and only those who had deep faith in the Heavenly Kingdom were ready to sacrifice all to obtain salvation. Christian morality at that time was on a high level. Then after freedom was declared in the year 313 under the rule of King Constantine, there was a movement in the Church of those “who did not find their treasures hidden in the field and were not ready to sell everything to buy that field (St. Matthew 13,44). At this behavior the level of morality of the Christians fell to a low standard. Many still approached Holy Communion regularly but without a serious commitment to Him. Others began to delay their trip to the Holy Chalice with the excuse of not enough preparation. But the effort of soul cleansing was only from time to time for a few days before Holy Communion. Even this practice became harder for them and they further delayed their preparation and their receiving of Communion until it happened that they communed only four times a year and it gradually became even less. In view of this situation, according to St. John Chrysostom, the Church established the forty day fast before Pascha. Realizing the danger that comes from such habits, the Holy Fathers ordered forty days of fasting that we all cleanse ourselves carefully through prayer, charity, fasting, vigils and tears. In this manner we may approach Holy Communion with a clear conscience as much as possible. As for the others, the Church Fathers say that they must make every effort, not only before Holy Communion, but always to live a Godly life in order to receive. When the question arises as to whose position is the correct one, those who commune infrequently or those who commune regularly? St. John answers that neither one is the answer, but only they who take Communion with a clear conscience, a clean heart and spotless life. These people may approach at all times and those who do not measure up to this – not even once. This will only bring on them condemnation, judgment and suffering. Of all the methods to cleanse the soul for this most important union with Christ in receiving His Body and Blood, our people see only the physical fast. Many priests pose before the faithful just one question – did you fast? When they answer positively, he allows them to approach, as if that one thing is of major importance. Everything else is secondary such as does he value the magnitude of what he is receiving, does he knows the Creed, basic prayers, is his tongue and mouth clear of lies, cursing and filthy language, and is he in a quarrel with someone? Fornication, adultery, frequenting fortune tellers, sorcerers and wearers of the evil eye should be asked. Do women practice abortion? Do they regularly pray, read the Bible and meditate? Pastors must avoid the mechanical approaches and insist that the faithful come as often as possible and commune at each liturgy with constant preparation and vigil over their souls. The spiritual father knows the spiritual condition of each member of his flock. To one he advises to come more often during fasting seasons, he could tell some to fast two or three days, to others seven days and to some to come always without fasting. It goes without saying that our faithful should be instructed towards frequent Communion, but under the condition of constant guard over the purity of soul, keeping spiritual fasts, guarding the heart, eyes, ears and senses of everything sinful and not only by observing physical fasts.